Bongo reaches 1m subscribers on YouTube! 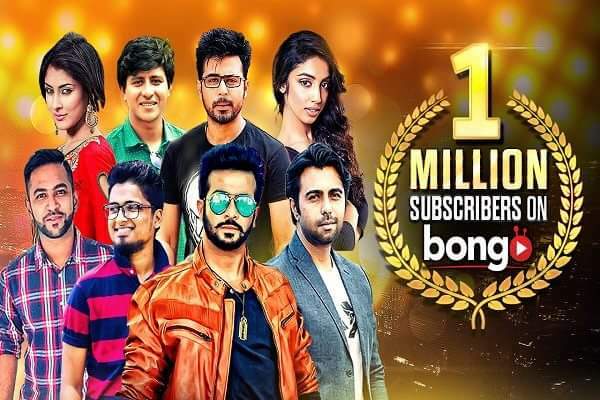 Bongo, the leading digital entertainment provider of Bangladesh, has reached the milestone of 1 million subscribers on their YouTube channel ‘BongoBD’. The feat was accomplished recently and gained recognition for Bongo from across the media industry for their role in promoting local content at home and abroad. In addition to 1 million subscribers on their flagship channel, Bongo also celebrates an important landmark on their YouTube influencer network. Across all YouTube channels managed and serviced by Bongo, they now reach over 1 million subscribers. Bongo is the first Bangladeshi company to achieve this feat. “Over the years we have built a certain expertise on growing an audience, monetization and copyright enforcement on YouTube. Now we want to use this knowledge to benefit local content creators,” says Ahad Bhai, Managing Director of Stellar Digital Limited, the company behind Bongo. Their network includes top YouTube channels like Jaaz Multimedia, Salmon the Brownfish, Bhai-Brothers, Gaan Friendz, Maasranga TV and famous Dhallywood actor Shakib Khan’s official YouTube channel. Bongo’s team helps label companies, TV networks, and content creators grow their audience to bring fresh and high-quality entertainment to the masses. “Online influencers on YouTube reach a dedicated, niche audience and interact with them in a profound way.” says Karel Kuipéri, Bongo’s Chief Operating Officer responsible for YouTube services; “We want to support that special connection by bringing value to the local creative community, audiences, and advertisers alike.” Bongo now manages over 140 YouTube channels in four countries. Founded in 2013, Stellar Digital Limited owns the largest Bangladeshi digital content library and develops cutting-edge video delivery platforms. In cooperation with Grameenphone Bongo has launched Bioscope, which is the largest Bangladeshi and award-winning platform for on-demand and Live-TV streaming. Bongo is set to receive the Golden Play Button from YouTube’s Singapore office for reaching 1 million subscribers on their channel.